If you're a level 20 PC nerd, you'll go to extreme lengths to improve system performance. And if you have budget to spare, you'll probably first turn to hardware upgrades—an almost surefire way to get an old PC purring like a hot rod. Sadly, though, throwing money down the hardware hole isn't always an option during our uncertain economic times, so free software tools that promise performance dividends become an enticing option. These utilities purport to cure a multitude of PC ills, and make grand claims of improved performance, faster boot times, and enhanced privacy. Some claim to help even with relatively new PCs running Windows 8. Plenty of these utilities look like scams—search for “improve system performance,” and you'll see what I mean. So, to save you the trouble of finding the best clean-up utility yourself, we rounded up five free PC cleanup utilities for the purposes of this article: SlimWare Utilities’ SlimCleaner, Piriform’s CCleaner, COMODO System Utilities, Ashampoo WinOptimizer, and PC Booster Energizertech's PC Booster. 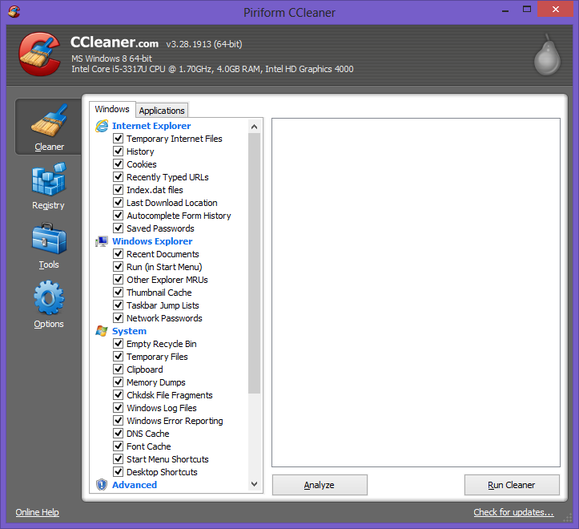 Piriform CCleaner is best suited to experienced PC users that want to know what they’re cleaning from their systems. 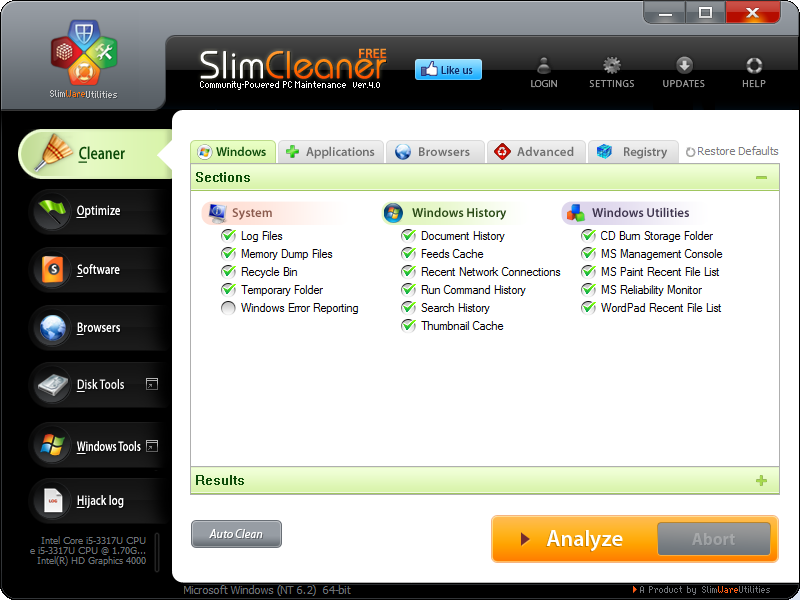 SlimCleaner and CCleaner are the no-nonsense members of the group. Both are completely free for personal use, don't include any useless or bloated software, sport simple interfaces, and weigh in at only 718K (SlimCleaner) and 4MB (CCleaner). 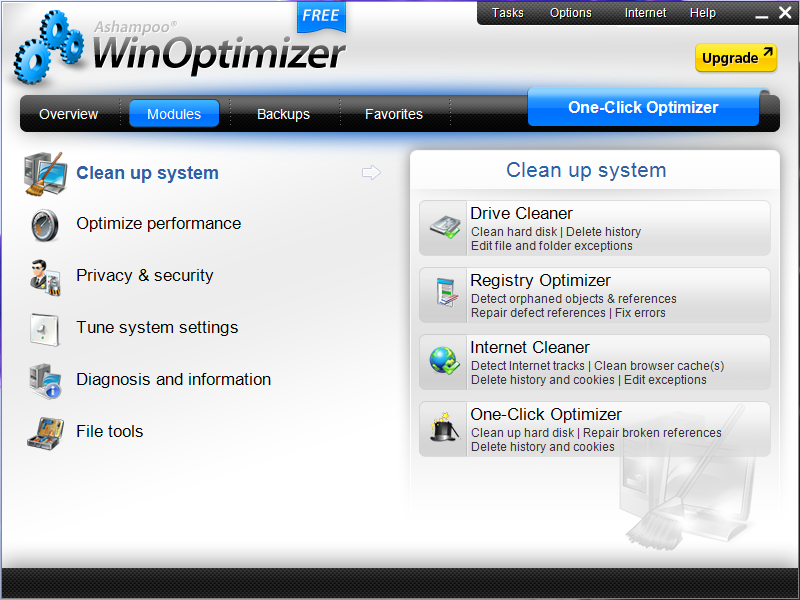 Ashampoo WinOptimizer was the largest of the bunch at 16.9MB and had the most complicated interface. COMODO System Utilities wasn’t too far behind at 13.2MB and the free edition of PC Booster came in at a paltry 2.7MB, but it turned out to be severely limited in its usefulness. 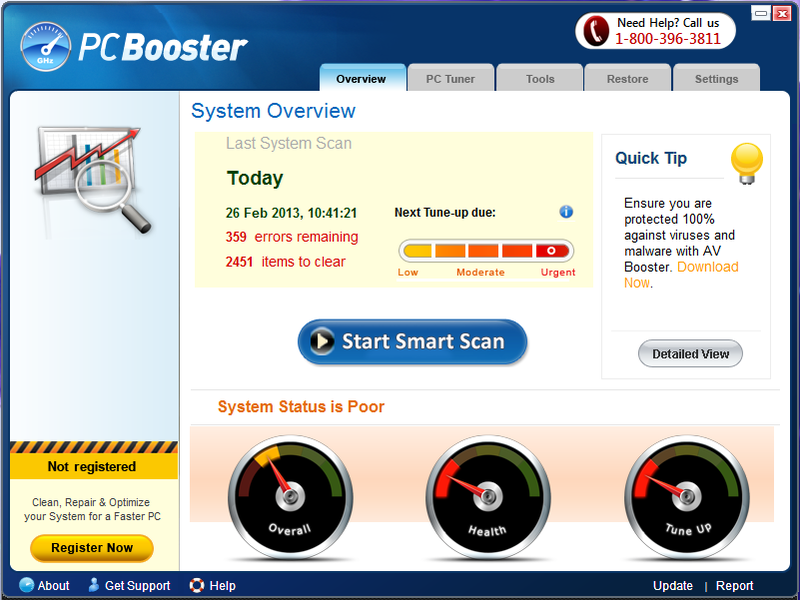 See, the free edition of PC Booster gives users the ability to fix only 15 issues. That's just not enough to be useful in the real world. For reference, 2830 issues were found on our test machine and it would cost $35 for the full version that would supposedly fix them all. SlimCleaner uses community-sourced information to determine what data is safe to purge from a system. All of the utilities featured here work in roughly the similar fashion. They scan your system for junk or useless data that’s just wasting space and mark it for deletion. They also scan the registry to find any unnecessary keys that can be removed. One of them—namely Ashampoo WinOptimizer—will also automatically check for superfluous startup items or services and disable them to free up memory and improve boot times. The other tools can be used to manually tweak startup items as well, which might be more palatable to experienced PC users who want to get their hands dirty. To replicate real-world conditions I stuck to a straightforward test routine while evaluating the effects of each of the cleanup utilities featured here. The test machine is an off-the-shelf Sony VAIO Tap 20 Windows 8 system that hasn’t been maintained at all for the last few months, save for automatically installing Windows Updates when necessary. The system is powered by an Intel Core i5-3317U 1.7GHz processor (2.6GHz with boost) with integrated Intel HD 4000 series graphics and 4GB of RAM. Storage duties are handled by a Hitachi 750GB, 5400 RPM hard drive and the system is outfitted with a 20-inch touchscreen that packs a native resolution of 1600-by-900. Ashampoo WinOptimizer is somewhat conservative with the junk data it will purge from a system, but it also recommends services to disable that may hinder boot times. The Sony VAIO Tap 20 is designed to be an all-in-one, shared family PC/oversized tablet, and that is exactly how it was used. None of the stock bloatware was removed, with the sole exception being a trial version of Kaspersky Antivirus that constantly threw up so many nag screens that they just became too annoying to ignore. The machine has been regularly used to browse the web, check social networking sites, watch videos, play casual games, and do a bit of writing. Also, a couple of toddlers had a field day installing numerous apps from the Windows Store. Before testing began I installed all of the clean-up utilities in this roundup onto the PC, but didn’t run them. Then I created an image of the entire OS installation that could be used to easily restore the PC back to pre-test conditions. Next, I ran some benchmarks on the PC and recorded some pertinent information, like used disk space and boot time. Finally, I ran one of the clean-up utilities, let it do its thing, then re-tested the system’s performance and recorded free disk space. The OS image was restored, and the process was repeated again for each utility. To get a general measurement of system performance, I used the PCMark 7 Productivity benchmark, which tests things like web browsing performance, starting applications, and data decryption. Boot times were recorded by using the free BootRacer utility to take any guesswork and potential human error out of the equation. Disk space was assessed by simply recording the amount of free disk space being reported by Windows 8’s File Explorer. Our benchmark tests were conclusive, but ultimately uneventful. COMODO System Utilities wouldn’t run properly on the Windows 8 test machine, so I do not have any before and after numbers for that tool. 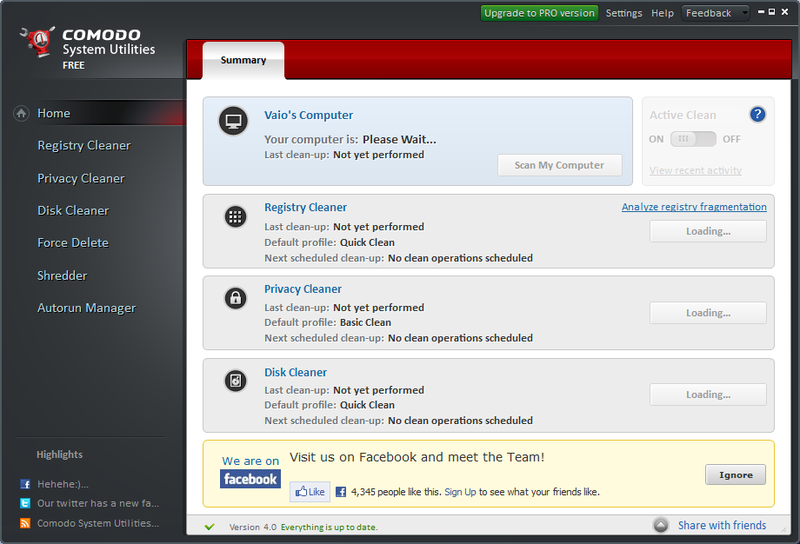 (To be fair, Comodo does not list Windows 8 as a supported OS.) The utility would launch properly, but never fully initialize or scan the system properties, so no cleanup options became available in its interface. Your mileage may vary, but it made for a poor first impression on WIndows 8. COMODO System Utilities v4 didn’t function properly on our Sony VAIO Tap 20 Windows 8-based PC. All of the other utilities worked well enough, but they didn’t have a meaningful impact on performance. In fact, according to PCMark 7 system performance went down ever so slightly after running SlimCleaner, CCleaner, and PC Booster, though boot time was improved somewhat with Ashampoo WinOptimizer. Presumably, that's because in addition to cleaning up junk files it shut down a few services running in the background. In terms of recovered disk space, CCleaner was able to purge slightly more junk data from the system, but the differences between the apps were negligible. I compiled the results below so you can see for yourself. Two of the tools, namely PC Booster and Ashampoo WinOptimizer, had a couple of unwanted consequences as well. Ashampoo WinOptimizer disabled the Touch Keyboard and Handwriting Panel Service, which really should have remained enabled on a multitouch-capable test system. And PC Booster set up a scheduled task that caused the application to pop-up onscreen asking users to register and buy the full version. That’s just gross, and unforgivable in my book. PC cleaning utilities have their uses, but the promise of quick fixes and enhanced performance are mostly bunk. With that said, in the hands of an experienced user some of these utilities can be quite useful and make easy work of junk data and unwanted startup items. 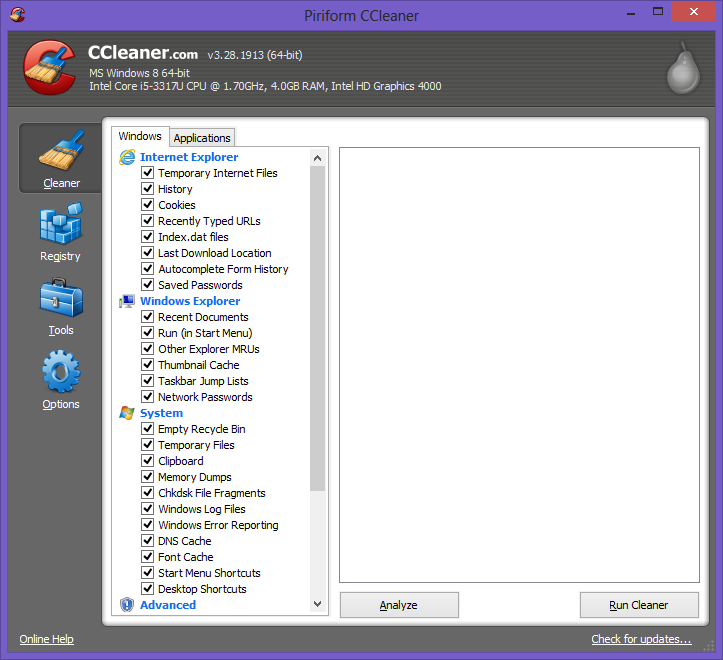 If that's all you need, CCleaner and SlimCleaner were clearly the most useful cleanup utilities due to their streamlined interfaces and ease of use (the fact that they’re free for personal use also helps). The free edition of PC Booster is essentially useless. Steer clear of this one. PC Booster should be avoided though. The free edition is severely hampered and not even worth the download in light of some of the other offerings, especially since it’s going to nag you with annoying pop-ups. Our tests suggest none of these utilities deliver the system supercharge their ads promise, but if you need a hand tidying up a cluttered hard drive you should at least stick with a utility that lets you work in peace.